When you want highly reliable call center services for your Irvine business, choose LaBell Exchange. With over three decades of experience, our family-owned and operated business is committed to consistently delivering exceptional phone answering services to all types of businesses in Irvine and surrounding Southern California areas. 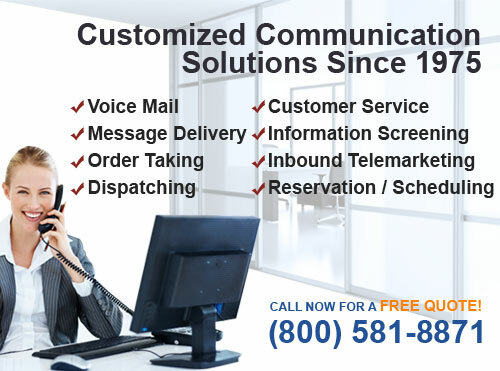 We are available 24 hours a day and our professional call operators are fully equipped to handle a wide range of phone answering services, such as advanced message delivery, appointment setting, dispatching, call analytics, call recording, call screening, HIPAA-compliant information screening, 800 service, consumer complaint hotlines, inbound telemarketing, event registration, scheduling, survey taking, message taking, order taking, virtual receptionists, voicemail, and purchasing. We even staff bilingual call operators who are fluent in English and Spanish, and offer translation services through a third-party company. Known for our cost-effective call center services, competitive prices, and hassle-free service terms, we have a reputation for delivering Irvine's best value in call center services. At LaBell Exchange, our phone answering services can be adapted to suit almost any business in Irvine. Over the years, we have provided our answering services to thousands of clients, including lawyers, doctors, dentists, hospices, plumbers, roofers, refrigeration specialists, landscape specialists, elevator maintenance specialists, municipal water districts, sole practitioners, equipment rental companies, bail bonds companies, towing companies, property management companies, service-oriented companies, HVAC (heating, ventilation, and air conditioning) companies, and others. Designed to enhance a business's image, efficiency, and accessibility, our call center services have helped our clients increase customer satisfaction and boost profitability--making it an excellent investment for businesses of all sizes. A seven-time winner of the nationally recognized ATSI (Association of Teleservices International) Award of Excellence, LaBell Exchange has a proven track record for delivering professional, courteous, and accurate phone answering services in Irvine and beyond. To learn more about our call center services, keep reading or give us a call. 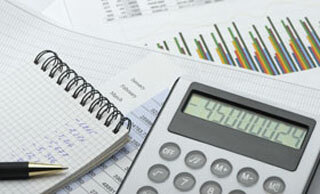 In business since 1975, LaBell Exchange provides service companies in Irvine with highly reliable call center services. We have experience working with a wide range of service-oriented companies, such as plumbers, heating and air conditioning companies, and roofers, and are able to handle large call volumes without sacrificing customer service. We always treat callers with courtesy and respect, and provide highly accurate telephone answering services 24 hours a day. We offer service companies in Irvine dispatching services, voicemail, customer service, virtual receptionist services, message taking and delivery, order taking, and more--all of which will deliver an excellent return on your investment as they are designed to improve your business's image, accessibility, and efficiency. Call today to learn more. With over 35 years of industry experience, we provide tow truck companies in Irvine with highly reliable call center services. From increasing your availability to making sure your Irvine tow truck company stays at the top of the Highway Patrol call-list, our call center services are competitively priced and deliver an excellent return on your investment. Available 24-hours a day, our telephone answering services include tow truck dispatching via cell and radio, customer service, and voicemail, as well as priority call screening to ensure immediate response to incoming calls. Contact us today to learn more. Cheaper than hiring support staff and renting additional office space, our competitively priced telephone answering services will allow your Irvine equipment rental company to increase operational efficiency and revenue. Our professional and courteous call center operators are available 24 hours a day to provide your clients with detailed rental, policy, pricing, and scheduling information. They can also be trained to take orders for the rental of bulldozers, forklifts, trucks, trench rollers, and other heavy-duty equipment, tools and attachments. Moreover, they can accept payment information, forward calls and messages, and dispatch drivers at any hour of the. Call today to learn more about our call center services for Irvine equipment rental companies. Whether you manage an apartment, HOA, townhouse, condo, or commercial property in Irvine, our call center services are sure to help you better serve your tenants while limiting after hour interruptions to clear emergencies. Our courteous phone answering operators are available 24 hours a day to provide customer service and coordinate maintenance service. They can also help with other tasks such as screening prospective lessees and scheduling property viewings. Our call center services in Irvine are highly customizable and can suit all kinds of budgets and property management needs. In fact, because we consistently provide Irvine commercial clients with fast response times and highly accurate phone answering services, we have earned the ATSI Award of Excellence seven years in a row. Call today. At LaBell Exchange, we offer Irvine's municipal divisions a wide range of call center services, such as 24-hour customer service for emergencies; voicemail trees to route calls to various departments and personnel; alarm monitoring of public spaces; information screening for water and energy rebate qualifications; bilingual telephone answering services (English and Spanish); language lines; and more--all for very reasonable prices without any long-term commitment. So call us today and learn more about our reliable answering services for Irvine municipal water districts, health and sanitation departments, parks and recreation departments, traffic divisions, fire departments, licensing offices, and other departments. Serving bail bonds companies in Irvine, LaBell Exchange's call center services are competitively priced and include options for 24-hour customer service, translation services, scheduling, 800 service, message taking, call routing, and voicemail services. We answer the majority of incoming calls within 3 rings and have the ability to establish priority queues, ensuring your customers get immediate assistance when they need it most. We also answer collect calls (perfect for callers currently in jail). Call today to learn more about our call center services for bail bonds companies in Irvine. Call LaBell Exchange today for 24-hour call center services you can rely on. We offer lawyers and attorneys in Irvine a wide range of phone answering services that will not only lower overhead costs but also enhance your efficiency and accessibility. Our call center services include customer service, message taking, scheduling, information screening, virtual assistants, voicemail trees, after-hours caller responses, and translation services. 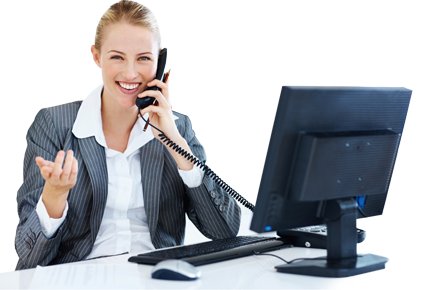 Our phone operators all sign confidentiality agreements and always deliver courteous, accurate, and professional answering services. With our fair rates and superior call center services, we have worked with countless attorneys in and beyond Irvine, including personal injury lawyers, worker's compensation lawyers, criminal defense attorneys, civil litigation lawyers, and more. Healthcare professionals in Irvine and surrounding cities love our call center services. Available for an incredible value, our telephone answering services have been used by hospitals, clinics, pharmacies, doctors offices, dentists, hospices, crisis centers, and rehab centers. Our staff are thoroughly trained and have the experience to handle patient calls in a compassionate, professional, and accurate manner. We staff operators fluent in English and Spanish, and also offer options for translation services over the phone. Customized to suit your needs and budget, our call center services can include HIPAA-compliant telephone answering services, 800 hotlines, 24-hour customer service, call routing to on-call doctors, emergency dispatching, appointment scheduling, inbound telemarketing (such as fielding incoming calls after a flu shot reminder campaign), voicemail trees, advance delivery via email, text, or cell, and more. Call us today to learn more.